Sicily has taken over me, myself & I. I would just like to jump on a plane and get this Sicilian craving over and done with. This pasta is an iconic dish of Sicily that originated in Palermo that had spread all over the island then to the rest of Italy. It's like a virus! But whether that part of Italy is just a few hundred kilometers away from its heart, no one can do it like how they do it in Palermo. Geez, just like any of Sicily's dishes anyway. That alone is the perfect reason to pack your bags and get yourself the real thing! Palermo is a messy, yet beautiful city. It's a place like no other. It's rich in everything that makes a city important. Its culture, history, architecture and of course, gastronomy makes it one of THE places to visit. Being more than 2,700 years old, it owes its richness from its former rulers, the Ancient Greeks, the Byzantines, the Arabs & the Normans. With all these cultural influences put in together, a superior gastronomy was created. With all these in mind, I can't wait to introduce my half-blooded kids to their roots. Food & family are integral parts of their lives and in Sicily, they have both. 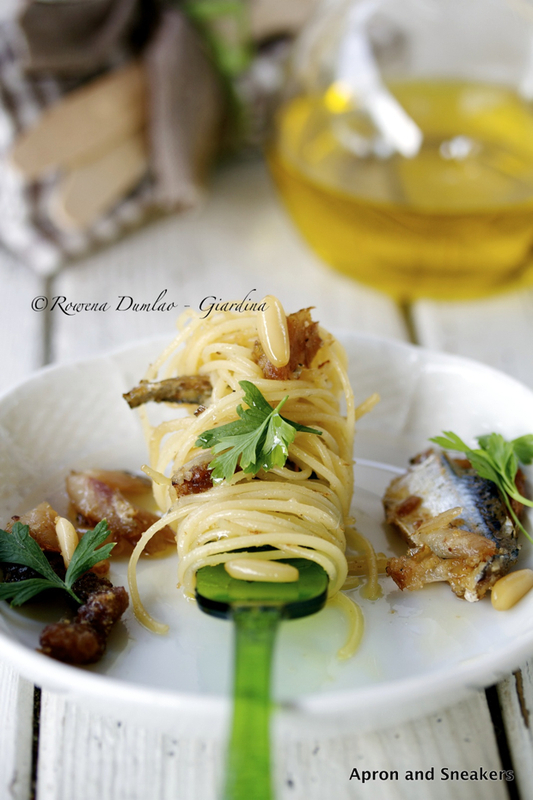 Called pasta che sardi or pasta chi sardi (depending on where you are in the island) in local dialect, the period to prepare this dish is between March and September when the fresh sardines are more available in the fish markets and when the wild fennel are out. With our local fishmonger, we need to order the sardines beforehand. We usually have some wild fennel plants in our garden and when I saw that the leaves were already starting to decrease, I thought that now is the time, before they disappear again. Wild fennel plants are hard to come by. You have to scrounge for them in the countryside. 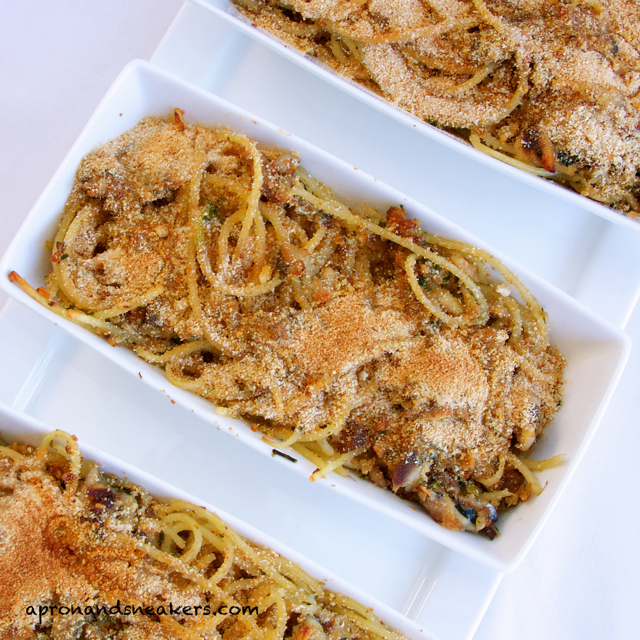 I adapted this recipe from my 10-year old recipe book, Flavours of Italy (Sicily). I have cooked some recipes from this book before and they came out well. When I bought it, I asked my mother-in-law to do a once-over to check if the dishes are genuine. It was ok with her so it gained a residential space in my bookshelf. This is the first time I tried this pasta recipe. I followed everything by heart but after the outcome, I would do some changes the next time I will do it again. The recipe says to bake it, which I did, and which I will not do again because baking dried up the pasta. My husband doesn't remember the versions he had being baked. I would put more raisins & mix sugar with the breadcrumbs to make it sweeter just like how his mother & aunts do it. Other than that, the pasta seems to be in order. Bring water to a boil in a cooking pot and add salt & fennel. Simmer for 15 minutes, then drain, reserving the water to cook the pasta. Squeeze the fennel to remove excess moisture & pat dry with kitchen paper towels. Chop coarsely. Set aside. Saute' the onion in a saucepan with extra virgin olive oil. 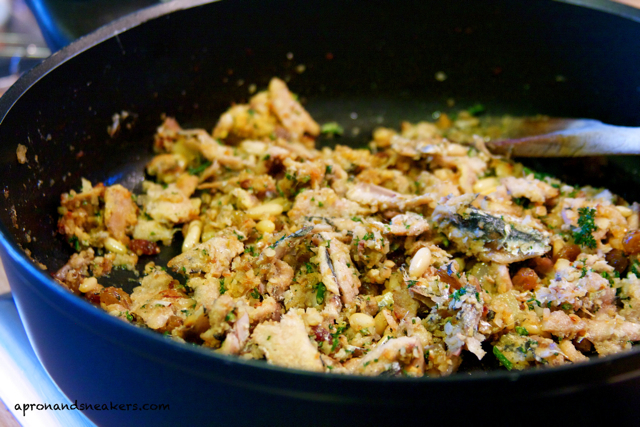 Add the anchovies, crushing them with a fork so that they dissolve in the oil. Cook over a moderate heat for 10 minutes before adding the fennel & saffron. Stir gently to avoid breaking up the fish (Mine did, however careful I was!). Reduce heat, cover & simmer for another 10 minutes. If it is becoming too dry, ladle some hot fennel-flavored water that you are keeping for cooking the pasta. Bring the fennel-flavored water to a boil. Add the pasta and cook following the cooking time suggested in the package reducing it by a minute to make it al dente. Mix the pasta with the sauce. 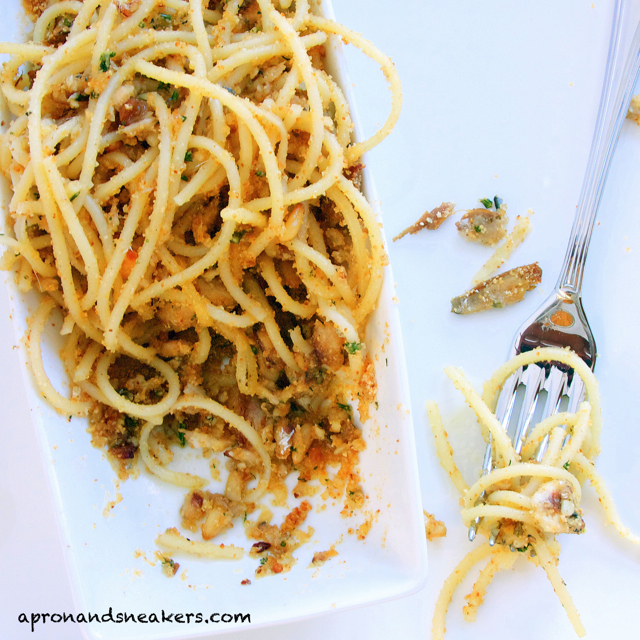 Mix toasted breadcrumbs & sugar together then sprinkle on the pasta. Drizzle with extra virgin olive oil before serving. 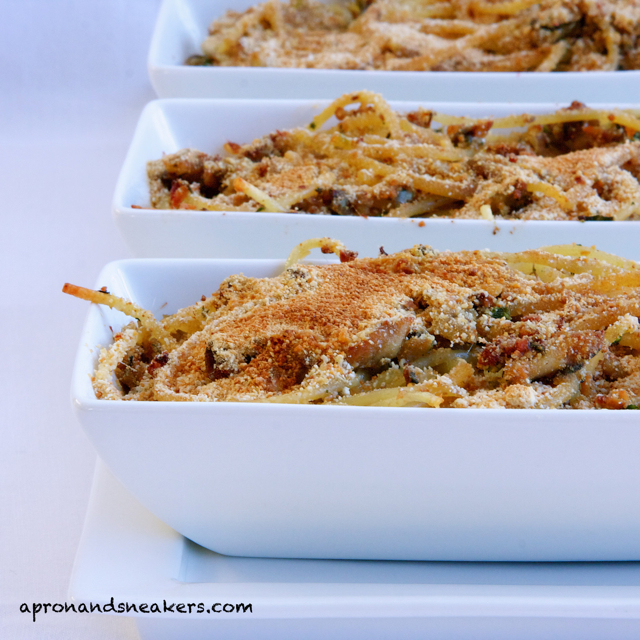 **At this point, the cookbook says to transfer the pasta to an oiled baking dish, sprinkle the breadcrumbs (without the sugar) and bake at 220°C for 6 to 10 minutes. I baked mine for 8 minutes and it came out dry.